Both Thomas and "Patty" Jefferson loved to read books together. No image survives of Mrs. Jefferson, although contemporary sources describe her as very pretty. 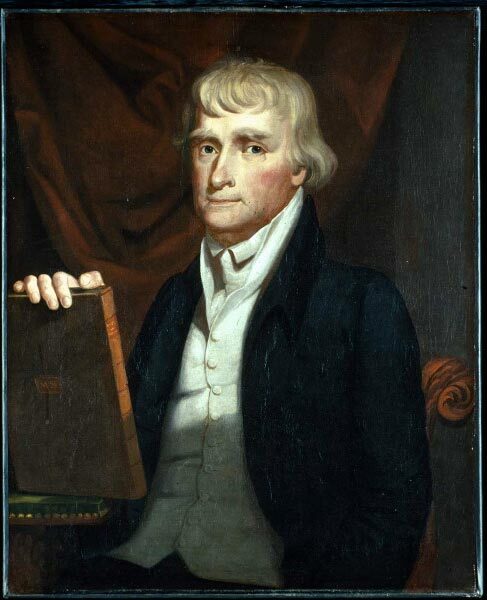 Pictured here with a book, Jefferson was grief-stricken when his wife died six years after the Declaration of Independence. Image online, courtesy Library of Congress. By the late summer of 1782, Mrs. Jefferson had suffered many miscarriages, lost three of her six children and was having difficulty recovering from the birth of her latest child, Lucy Elizabeth. Scholars today speculate she may have had diabetes. If so, 139 more years would have had to pass before the discovery of insulin would help physicians to treat diabetic patients. Although Mr. Jefferson's duties often separated the couple, they remained in love and totally devoted to each other. When Lucy was only four months old, her mother grew increasingly weak. As the couple had always enjoyed making music together, so they liked to read their favorite books out loud. One of their most-loved stories was Tristram Shandy by Laurence Sterne. In September, at Monticello, Mr. Jefferson was never far from his wife's side. While she slept, he worked on Notes on the State of Virginia. While she was awake, he sat nearby, holding her hand. This, however, was an illness from which she would not recover. which we are shortly to make! Their last writing survives. Soon after it was finished, Mr. Jefferson's "Patty" was gone. My dear wife died this day at 11H - 45' A.M.
... a little emerging from the stupor of mind which had rendered me as dead to the world as [she] was whose . . . loss occasioned it. Some of the family's servants witnessed a conversation between the Jeffersons, shortly before the end. Patty had lost her own mother and was very worried about her children being raised by a stepmother. She therefore extracted a promise from Thomas that he would never marry again - and - that he would take care of their daughters. It was Martha, Jefferson's oldest daughter, who helped her father emerge from his "stupor." She became his constant companion, often seeing his outbursts of grief. When he finally left his room, to ride his horse, she followed to be sure he was alright. Their bond continued for the rest of Mr. Jefferson's life. Bos, Carole "TIME WASTES TOO FAST" AwesomeStories.com. Jul 01, 2008. Apr 23, 2019.